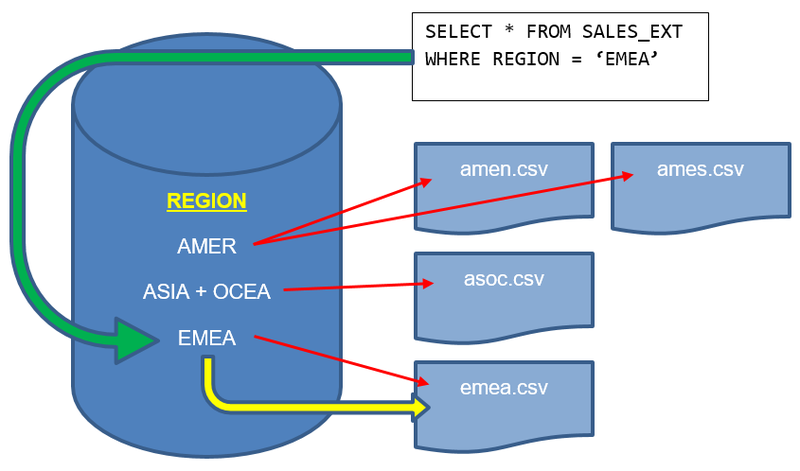 Those CSV files contain sales data per region and country. We're getting those files from 4 offices around the world. So, as user HR, let's use these files in an external table to be able to query those sales data. We put all the files in the LOCATION clause, that way when we select from the external table, all the files will be read. Yup, all the rows from all 4 files are shown, just like we want it. If we look at the plan used, we see a full table scan of the external table. So all the files have been read, and then those rows that weren't from EMEA was discarded. A bit of a wasted effort, since we happen to know that the data for region EMEA only exists in one of the 4 files. So we drop this approach and try it a bit differently. We create three partitions, where we tell the database that region AMER is in two files, regions ASIA and OCEA both are in one file, and region EMEA is in the last file. No change in the output, of course. The plan this time changes to PARTITION LIST SINGLE and in Pstart/Pstop is shown that only the third partition is accessed. This means that only file emea.csv has been read. Note that there is no filter here, it is not necessary as the database knows, that partition 3 contains all the data for region EMEA and nothing but data for region EMEA. This is about as efficient as it can get. Again a PARTITION LIST SINGLE and Pstart/Pstop shows we scan the second partition. But since the partition contains two regions, this time a FILTER is needed. Still it is better than without partitioning, because we only read the single file necessary and only discard ASIA rows, rather than reading all files and discarding almost all rows. But one thing you must beware of is, that for external tables the partitioning is not enforced - it cannot be. The database trusts you and believes you are telling it the truth. What? The output shows two rows that doesn't satisfy the WHERE clause? How did that happen? So the database trusted us when we told it that file emea.csv contained only EMEA region data, therefore it didn't do any superfluous checking. That we lied to the database is our problem, so we're to blame for the "wrong" output. And the row for Argentina is not shown in the output even though it has region AMER? So in all, partitioning external tables is very handy to avoid unnecessarily reading files that we know doesn't contain the data we are querying. We just have to be certain the data really is distributed in the files matching what we describe in the list partitioning clauses - if it isn't, we risk wrong output.